For bloggers, comments are wonderful to receive. It's heartwarming to know people read your blog & have something to say about it. But there's something you should be aware of: spam comments! I want to talk to you about how to identify spam comments & why you shouldn't publish them on your blog. Now I'm not talking about those generic comments from fellow bloggers that go something like this: Great post! 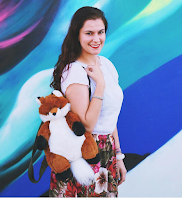 Follow me on Bloglovin. Here's my Facebook page & don't forget to check out my blog! Those comments are pretty annoying too & the author ought to read up on the DOs & DON'Ts of Leaving Blog Comments, but they don't have the same level of harmful spam. Keep reading to learn more! What does a spam comment look like? Spam comments may seem genuine but they are often copied & pasted, can be vague & even plain old dumb. For example the comment below sounds like it could be real. They start out by saying they rarely comment & then making a remark about readers, so it sounds like it could be a genuine comment. But here's how you know that it's spam: the second part of their comment asks about my social media profiles because they supposedly want to follow me. Well if you actually read my post -- or any of my posts -- I always include a list of my social media profiles, so obviously this is some sort of generic spambot comment with no thought value. Followed by a random link to a strange site. No thanks! How do I identify a spam comment? Spam comments are often created by spambots & sometimes humans too. A spambot is an automated computer program designed to send out spam. The first & most obvious way to identify a spammy comment is if it landed in your spam comment area. That's why I make sure to approve every comment before it's published so I can monitor & control the content on my blog. The second way to know if it's spam: most spammers use anonymous comments. They don't leave their email, their name or any way to get back to them. Now take a look at the comment itself. It's usually generic, vague, & nonsensical. Does it have any relevance to the post or your blog at all? Do they mention things that don't pertain to you or the post? DELETE IT! Why shouldn't I publish spam comments? 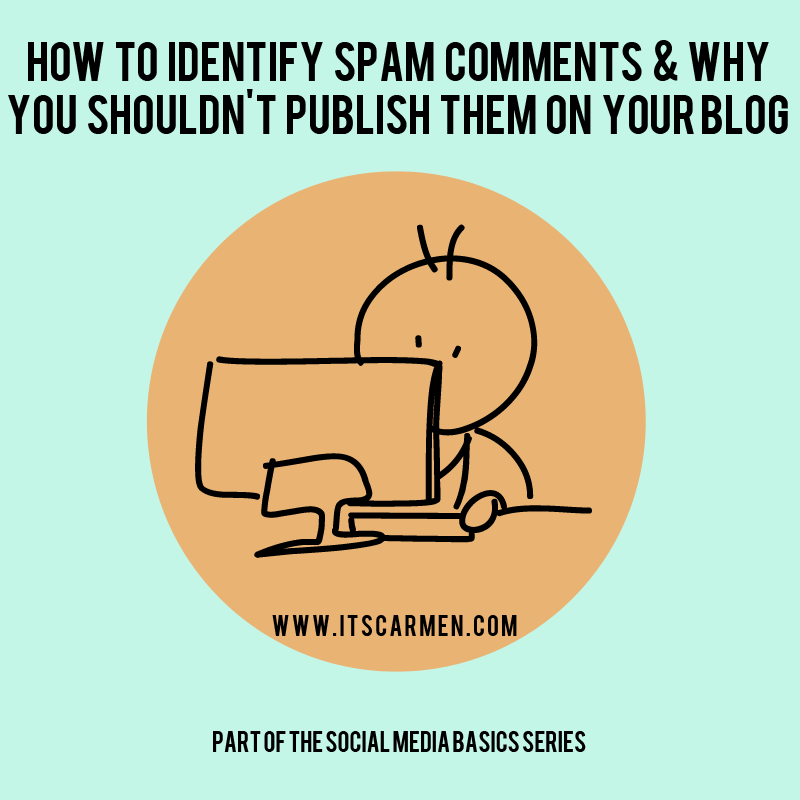 You may want to increase the number of comments on your post, but publishing a spammy comment is toxic to your blog. Spam comments are a way of spamdexing. What the heck is spamdexing? It's a way of manipulating search engine indexes. I whited out the spammy links on the comments (uh hello, I don't want to perpetuate their websites!! ), but the links are often long, have random keywords, numbers & letters, & overall, don't seem right. According to Wikipedia, when you publish their comments you indeed help them increase their ranking; the spammer's commercial site gets listed ahead of other sites for certain searches, which increases the number of visitors & possible customers. Don't help them out & don't publish their comments! Great post! I will have to start paying attention to what is being put on my blog and who comments on the post! Really useful! Great post! 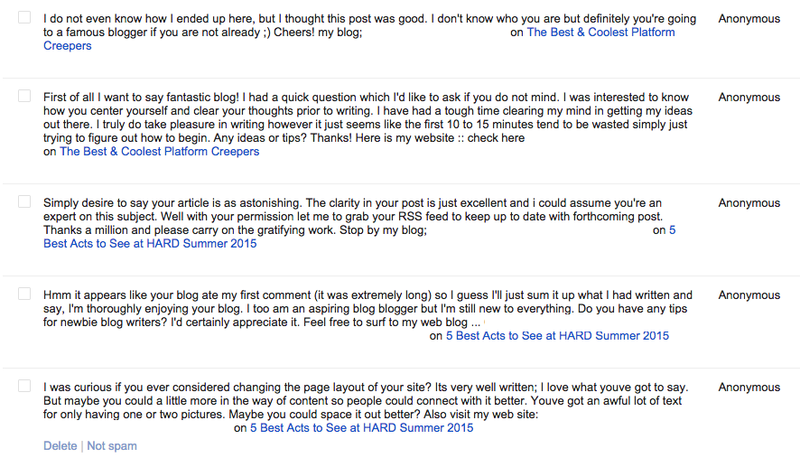 I hate spam comments and I think it's important for bloggers, particularly new ones, to know how to identify them. I might have to think about changing the settings on my blog so that I approve comments before they are published. This was a really helpful post, especially for someone with a relatively new blog! I get so excited when I see I have a new comment to review but the majority of the time it's spam >:| Great and helpful article. Thank you, this was really informative & helpful!! This is a great post! Very informative and helpful because I get stung by this a lot. I don't know if you can help me, I have the same layout, how do you put stuff in the left hand side of the posts? Cant work it out haha. This a good information for new and old bloggers. I have a plug-in that catches them! Thanks for sharing! Thanks for this! This was of great use to me, particularly as quite a new blogger. I stopped getting this crap ever since I got G+ comment, did not miss that at all, it was so annoying! My god, I totally agree. I haven't set my comments to be approved, but now I'm thinking I should. Im so sick of hearing "Nice post", "nice blog", "nice pics"....arghh, if you dont have anything nice to say dont say it at all. i AGREE! It's so annoying to see spam on a post you worked so hard on!! Loving your post and blog so i followed on blog lovin and google :) i also really loved your diy lipgloss so helpful!!! You've given some fabulous tips and im working on getting a spam bot! I moderate all of my comments and this week had a TON of spam! It's annoying but I'm always happy to see the authentic comments that are left. Come see what I'm loving right now! Thank you for this. I always delete spam anyway because honestly, I'm annoyed if I see spam posts on a website, so why wouldn't my readers be annoyed to see it on my site? Of course they will be annoyed! That said, I had no idea that leaving comments helps spammers! It makes sense when you think about it, but really, I don't want to help them in any way! Yep, publishing the comments helps the spammer gain more views! That's crazy how spammers have gotten good at making their comments look genuine :( Now I know what to look out for! I usually find spam comments annoying, but I didn't think much about them other than that. Thanks for sharing tips on how to identify spammers. I'll definitely be deleting spam comments from now on! Oh gosh. That's a lot & it also messes up your view count! Glad to know about this stuff. I am going to delete these comments, thanks for sharing! I'm really rubbish at keeping an eye on spam comments because I didn't realize the impact of them! I thought if I just ignored them, they've theoretically gone away- thankyou for bringing this to me attention! OMG I had no idea this was a thing. I never publish anonymous comments on my blog unless they really seem genuine but I'll be even more careful from now on ! This is such an informative post but it's made me so paranoid about my blog comments haha! Some of them have been filtered out as spam but I've posted them because they sounded genuine. Oops! I will definitely be looking out for these comments! Luckily with Disqus they're pretty good at identifying spam comments and not publishing them until you review them, so it's easy to just go in and delete them! As a new blogger I didn't think twice about modifying my comments as I actually believed it would make my followers refrain from leaving a comment at all. I didn't think for one minute about spam comments. I'm so glad I read this though, because I'm going to go straight back to my blog and change my settings and review my comments to see if any of these have already been posted. Whoa, no idea those were spam comments! I've gotten a couple of comments on my blog that were obviously spam because they were super vague, but if I had gotten one of those comments like the ones you listed here, I would've thought they were genuine. Spam bots are getting more and more impressive these days lol. Right after I post this reply, I'm gonna figure out how to filter comments haha. Thanks, Carmen!